For the songwriter/composer, see Bob Merrill. 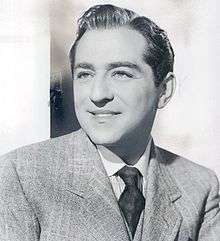 Robert Merrill (June 4, 1917 – October 23, 2004) was an American operatic baritone and actor, who was also active in the musical theatre circuit. He received the National Medal of Arts in 1993. Merrill was born Moishe Miller, later known as Morris Miller, in the Williamsburg section of Brooklyn, New York, to tailor Abraham Miller, originally Milstein, and his wife Lillian, née Balaban, Jewish immigrants from Pultusk, Poland near Warsaw. His paternal grandaparents were Berl Milstein and Chana (née Mlawski) both from Pultusk, Poland. His mother claimed to have had an operatic and concert career in Poland (a fact denied by her son in his biographies) and encouraged her son to have early voice training: he had a tendency to stutter, which disappeared when singing. Merrill was inspired to pursue professional singing lessons when he saw the baritone Richard Bonelli singing Count Di Luna in a performance of Il Trovatore at the Metropolitan Opera, and paid for them with money earned as a semi-professional pitcher. In his early radio appearances as a crooner he was sometimes billed as Merrill Miller. While singing at bar mitzvahs and weddings and Borscht Belt resorts, he met an agent, Moe Gale, who found him work at Radio City Music Hall and with the NBC Symphony Orchestra, conducted by Arturo Toscanini. With Toscanini conducting, he eventually sang in two of the maestro's NBC broadcasts of famous operas, La traviata (with Licia Albanese, in 1946), and Un ballo in maschera (with Herva Nelli, in 1954). Both of those broadcasts were eventually released on both LP and CD by RCA Victor. His ranking as an important NBC performer is evidenced by his inclusion in NBC's 1947 promotional book, NBC Parade of Stars: As Heard Over Your Favorite NBC Station, displaying Sam Berman's caricatures of leading NBC personalities. Merrill's 1944 operatic debut was in Verdi's Aida at Newark, New Jersey, with the famous tenor Giovanni Martinelli, then in the later stages of his long operatic career. Merrill, who had continued his vocal studies under Samuel Margolis made his debut at the Metropolitan Opera as winner of the Metropolitan Opera Auditions of the Air in 1945, as Germont in La traviata. Also in 1945, Robert Merrill recorded a 78rpm record set with Jeanette MacDonald featuring selections from the operetta Up in Central Park; MacDonald and Merrill did two duets together on this album. In 1951, Merrill did a series of duet recordings together with the Swedish tenor Jussi Björling, including a world-renowned recording of "Au fond du temple saint" from the opera Les pêcheurs de perles by Georges Bizet. Again in 1952 Merrill, Björling, and Victoria de los Ángeles made a widely admired RCA Victor recording of Puccini's La bohème, conducted by Sir Thomas Beecham. In 1953, Merrill, Björling, de los Angeles and Zinka Milanov recorded the complete Pagliacci and Cavalleria rusticana. His role in the musical comedy film Aaron Slick from Punkin Crick (1952) led to a conflict with Sir Rudolf Bing and a brief departure from the Met in 1951. Merrill sang many different baritone roles, becoming, after the untimely on-stage death of the celebrated Leonard Warren in 1960, the Met's principal baritone. In the late 1950s and early 1960s he appeared under the direction of Alfredo Antonini in performances of arias from the Italian operatic repertoire for the open air Italian Night concert series at Lewisohn Stadium in New York City. He was described by Time as "one of the Met's best baritones". Yet reviews were not consistently good: Opera magazine reported on a Metropolitan Opera performance of Barber of Seville in which Merrill delivered "by all odds the most insensitive impersonation of the season". He was accused by the reviewer of "loud, coarse sounds" and "no grace, no charm, as he butchered the text and galumphed around the stage". Merrill appeared on"Voice of Firestone" with Joanne Hill. Merrill also continued to perform on radio and television, in nightclubs and recitals. In 1973, Merrill teamed up with Richard Tucker to present a concert at Carnegie Hall—a first for the two "vocal supermen" (as one critic dubbed them), and a first "for the demanding New York public and critics" Merrill recalled. The event marked a precedent that would lead eventually to the "Three Tenors" concerts many years later. Merrill retired from the Met in 1976. In 1977, he appeared on the TV special "Sinatra & Friends," soloing "If I Were A Rich Man" and performing "The Oldest Established Permanent Floating Crap Game in New York" with Frank Sinatra and Dean Martin. For many years, he led services, often in Borscht Belt hotels, on Rosh Hashana and Yom Kippur. In honor of Merrill's vast influence on American vocal music, on February 16, 1981 he was awarded the prestigious University of Pennsylvania Glee Club Award of Merit. Beginning in 1964, this award "established to bring a declaration of appreciation to an individual each year that has made a significant contribution to the world of music and helped to create a climate in which our talents may find valid expression." Relatively late in his singing career, Merrill also became known for singing "The Star-Spangled Banner" at Yankee Stadium and Giants Stadium. He first sang the national anthem to open the 1969 baseball season, and it became a tradition for the Yankees to bring him back each year on Opening Day and special occasions. He sang at various Old Timer's Days (wearing his own pinstriped Yankee uniform with the number "1 1⁄2" on the back) and the emotional pre-game ceremony for Thurman Munson at Yankee Stadium on August 3, 1979, the day after the catcher's death in a plane crash. He would also sing at one World Series game in each year the Yankees played the Fall Classic at the stadium, starting in 1976. A recorded Merrill version is sometimes used at Yankee Stadium today, mainly at Old Timer's Day. Merrill preferred a traditional approach to the song devoid of additional ornamentation, as he explained to Newsday in 2000, "When you sing the anthem, there's a legitimacy to it. I'm extremely bothered by these different interpretations of it." Merrill appeared as himself in a cameo role, singing the national anthem, in the 2003 film Anger Management. Merrill joked that an entire generation of people know him as "The 'Say-Can-You-See' guy!" (Agmazine, April 1996). While there has been dispute regarding his birth year (some claim he was born in 1919), the Social Security Death Index, his family, and his gravestone state that he was born in 1917. Merrill was married briefly to soprano Roberta Peters in 1952. They parted amicably; he had two children, a son David and a daughter Lizanne, with his second wife, Marion (d. March 20, 2010), née Machno, a pianist. Merrill liked to play golf and was a member of the Westchester Country Club in Rye, New York, for many years. He always maintained a warm sense of humor and once recalled the time a young contractor was working in his New Rochelle, NY home. Surveying the photos, posters, plaques and other music memorabilia in the Merrill home, the young man asked Merrill, "You're a singer, aren't you?" "Yes," he responded. "You sing opera, don't you?" the worker asked. "A little," replied Merrill. (Agmazine, April 1996). He wrote two books of memoirs, Once More from the Beginning (1965) and Between Acts (1976), and he co-authored a novel, The Divas (1978). Merrill toured all over the world with his arranger and conductor, Angelo DiPippo, who wrote most of his act and performed at concert halls throughout the world. He always donated his time on the Cerebral Palsy telethon with Dennis James. Robert Merrill died at home in New Rochelle, New York, while watching Game 1 of the 2004 World Series between the Boston Red Sox and the St. Louis Cardinals. He is interred at the Sharon Gardens Cemetery in Valhalla, New York, which is a subdivision of the Kensico Cemetery. His headstone features an opera curtain that has been drawn open. Like a bursting celestial star, he showered his family and the world with love, joy, and beauty. Encore please. ↑ "The University of Pennsylvania Glee Club Award of Merit Recipients". ↑ Record of Robert Merrill, Social Security No. 081-07-2677, issued in the state of New York, in: Ancestry.com. Social Security Death Index database on-line. Provo, Utah, USA: The Generations Network, Inc., 2008.